CANTON, Mass. — Canton took an early lead, only to see Foxboro find the equalizer just over 10 minutes later. Foxboro took its turn with the lead, netting the go-ahead goal late in the second half, only for Canton to respond with the tying tally seven minutes later. The result was a 2-2 tie at Veterans Memorial Field and a key point for both sides in a Davenport division clash. The Bulldogs cashed in less than 10 minutes into the game, taking advantage of a long throw from junior Paul Corcoran. The service found its way into the area, and after a scrum in front of the goal, senior Jake Verille found the back of the net to go up 1-0. Canton nearly doubled its lead in the 15th minute when a loose ball fell to Griffin Roach just inside the area. 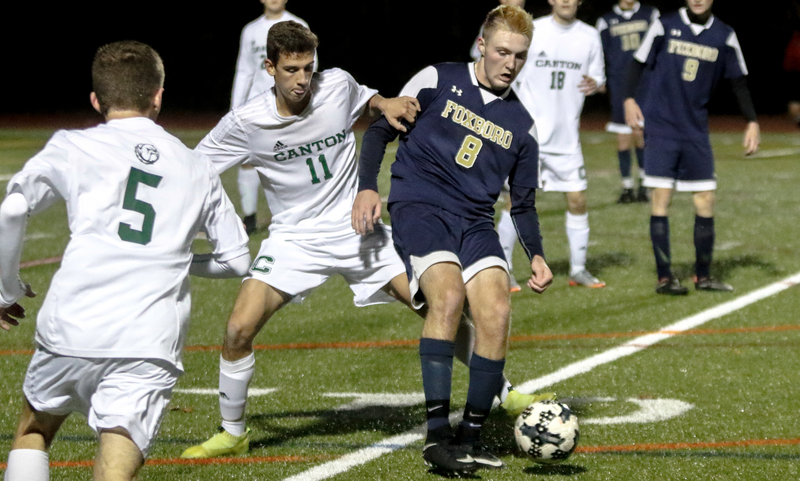 The junior connected his boot to the ball on the bounce, sending a shot destined to go right under the bar but Foxboro senior goalie Bobby Harrison made a last second class save, tipping the ball over for a corner. That save proved beneficial for the Warriors, as they leveled the match just over five minutes later. After most of the play was in Foxboro’s defensive third, the Warriors broke out on the counter. 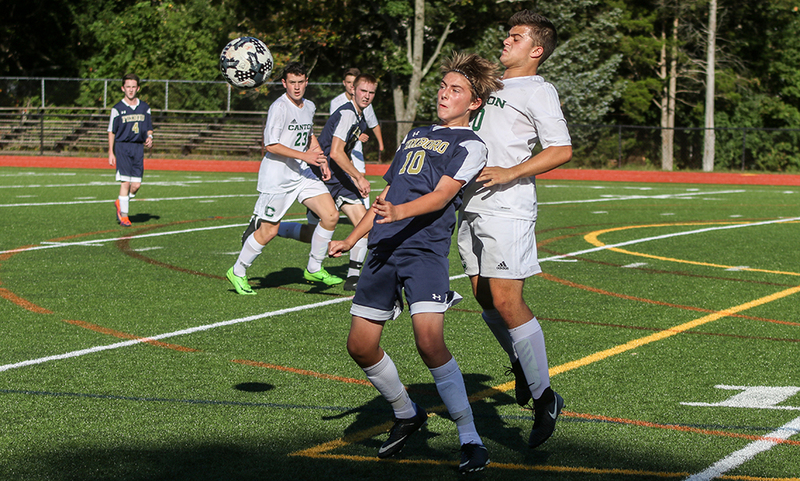 Foxboro senior Cam Cass sent a service to the far post, and an errant header from Canton put the ball right at the feet of sophomore Dylan Barreira and he buried his close-range bid to level the match. The Warriors put another one in just minutes later on a training ground routine on a corner kick. The corner was played short and let through on a dummy, allowing Ryan Kelley to place his shot to the far post but Cantons senior goalie Abe Garber was quick to get down and make the stop. Foxboro started the second half on the right foot, as Cass nearly set up another tally. This time, he sent a low service to the near post that found Shane VandenBoom but he was defended perfectly by Canton’s Chris Milne and he blocked the touch at the near post. Canton had an immediate response and nearly re-took the lead in the 50th minute. Roach made a darting run with possession into the area and ripped a shot to the near post. Harrison made the initial save but it looked as though the Bulldogs had a chance to bury the rebound, but Foxboro’s Matt Rongione made the clearance. It was the Warrior’s turn for a chance in the 54th minute when sophomore Joe Cusack laid a perfect ball over the top for Kelley, but his near side bid hit off the post and stayed out. Ten minutes later, Foxboro was finally able to break through again. A Canton clearance was blocked down and the ball fell right to VandenBoom, who took a couple touches forward before lofting a perfectly weighted ball over Garber and just under the bar to make it 2-1. Foxboro nearly put the game away just moments later when Cusack sprang Kelley in, but Garber did nicely to stop the shot at the near post. After a Canton free kick was cleared, Milne released a shot from distance that forced Harrison to tip the ball over the bar. On the ensuing corner kick, it looked as though the service was going to go over everyone and out for a throw. But instead, Corcoran tracked it down, using an acrobatic bicycle kick to keep the ball in and keep possession with the Bulldogs. The ball ended up back with Roach at the top of the area but his shot was blocked. However, the ball fell right to the feet of Corcoran on the six-yard line and he made no mistake about his chance from close, making it 2-2. “We can learn from today, we’ve seen them now too so that helps,” Franchino added. “I think the only thing they were dangerous on was the log throw and they have some big guys up front. But for the most part, I thought we were the better team. Rongione had one final chance just before the final whistle, ripping a shot from distance but it just sailed over the crossbar. 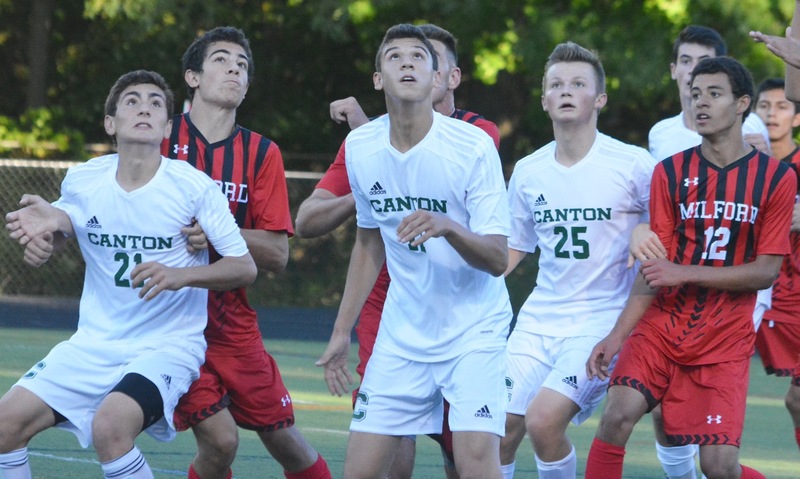 Canton boys soccer (4-2-2 overall, 3-2-2 Hockomock) finishes up its first trip through the Davenport schedule with a trip to Stoughton on Monday. Foxboro (4-2-2, 3-2-2) also wraps its first trip through the division schedule with a trip to unbeaten North Attleboro.